With the sun rays shining through your windows earlier and earlier each day, now’s the perfect time to throw on the shoes and start your day with a local cup of joe. 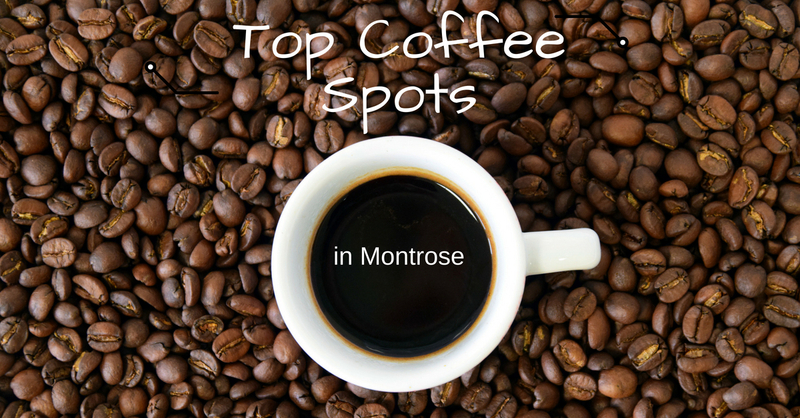 Here are some of our favourite coffee shops in Montrose. Built from the ground up, Buckhorn Coffee provides exquisite roasts sourced from all over the world. Specializing in everything from single origin to blends, you will love their brews. The open, sunny atmosphere of their store is perfect for the start to a warm, spring day. If you’re looking for a delightful cup of coffee in a more neighborhood cafe feel, swing by The Coffee Trader. Experts at brewing the best cup, folks at The Coffee Trader also listen to customer’s ideas about coffee, creating room for opportunity in every cup. Be sure to check out their unique “Freezerz” concoctions the next time you’re there. Ready to serve you bright and early, the people at Light House Coffee & Eatery know exactly how to brew the best cup of coffee for each individual. Swing by, tell your barista what type of coffee you’re feeling and you’ll be sitting on their patio with an absolutely delicious cup of coffee. Order a breakfast burrito to go with your coffee and you’ll never want to leave this amazing Eatery. If there’s one thing Backstreet Bagel knows how to do, it’s starting you off on the best breakfast combo you could ever ask for. Backstreet Bagel offers delightful drip coffee or some really extravagant options, such as the Mint Tulip latte, that won’t leave you disappointed. Order one of their lavish bagels to go with your coffee and your day is sure to be off to a good start.